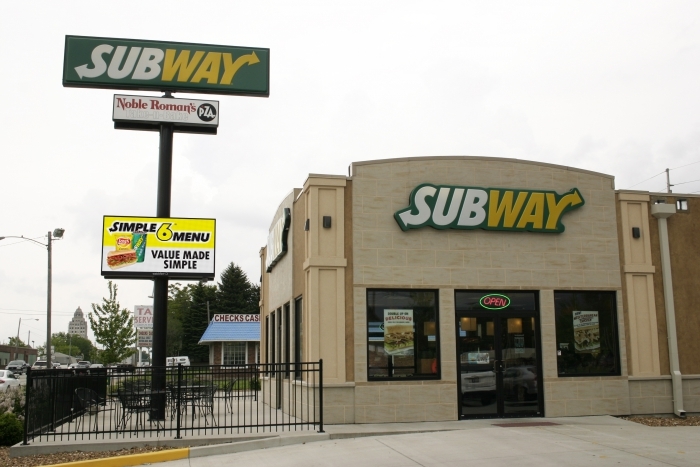 Subway restaurants in Decatur, Illinois are becoming increasingly successful, thanks to the addition of LED message centers at select locations. Gary Haines, President of Decatur Subway, Inc. owns several Subway locations in the Decatur area, and he is sold on their impact, and Watchfire’s quality. Haines worked with Bob Hawkins at A B Distributing to install 19mm message centers at two of his Decatur locations: a 16 x 128 display and a larger 64 x 128 display. He works with the Subway on monthly promotions, and does the programming of the signs’ content himself. He estimates an approximate 10% increase in sales since installing both signs, but he is equally interested in the residual affect and the goodwill it fosters in the community. He is committed to using the signs for the display of community messages that support veterans’ groups, promote local events like car shows, and recognize employees who excel at their jobs. Customers mention seeing messages on his signs, commenting how they have a positive image of his stores as a part of the community. Haines looked at other companies and LED sign manufacturers before purchasing his Watchfire sign through A B Distributing, one of Watchfire’s authorized dealers. “Sure,” says Haines, “you can find a cheaper sign out there. But you get what you pay for. I’ve seen demos for some of those other signs and I wasn’t impressed with their looks, their resolution, or their durability." He reports minimal issues with his signs, and those were always taken care of quickly and professionally. In fact, Haines is already making plans for the next Watchfire LED sign that he will be purchasing. Our blog features more information about how LED signs can help you reach your goals.